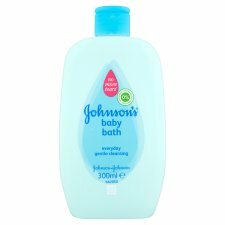 As gentle on baby's skin as pure water, Johnson's® Baby bath is suitable for the every day cleansing of baby's skin. With a babyfresh scent, Johnson's® Baby bath is pH balanced, soap and paraben free and features the NO MORE TEARS™ formula that's gentle on the eyes. JOHNSONS'S®. Trusted by mums for over 100 years. WARNING: For external use only. Keep out of reach of children. Packaging contains small parts which could cause a choking hazard. To use: Add to running water and swirl by hand in baby's bath. Gently lather, rinse and snuggle.